Tella’s brother is dying. Her parents move them from Boston to the middle of nowhere Montana to get some fresh air. At the beginning to Fire & Flood Tella is going a little bit stir-crazy. When a mysterious box appears in her bedroom she is propelled in to a race called the Brimstone Bleed. The winning prize is a cure for her brother. I went back and forth on whether or not I liked Tella. It wasn’t that Tella wasn’t a consistent character; she was just consistently back and forth. One second Tella would be fighting her damndest to save her brother and the next she would be lamenting the fact that she didn’t have any makeup in the middle of the jungle. I had a hard time getting a good read on her, if she had been more focused on saving her brother rather then makeup and boys I think I would have liked her a little more. Although, this would have been a very different novel if Tella hadn’t been so light. This novel was actually rather funny because of Tella. What I didn’t like was the romance between Tella and Guy. It wasn’t the relationship itself that I disliked it was how it came to be and how Tella acted in it. In the beginning Guy is all stay away from me, I hate you. It was SO familiar I couldn’t take it seriously. Then after a few chapters they are together and he mysteriously doesn’t hate her anymore. On top of that Tella doesn’t need Guy. 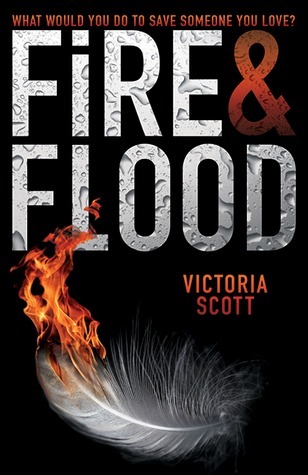 She is a badass in her own right, the ending of Fire & Flood showed that. It is really too bad that after Guy and Tella got together she depended on him rather then herself. I wanted her to be more independent. One thing I really liked about Fire & Flood was the Pandora’s. They hatched from eggs and became companions to those competing in the Brimstone Bleed. I loved Tella’s compassion for these animal-like beings. I also enjoyed discovering their different powers. The ending of Fire & Flood was amazing. The novel got off to a slow start but the last 100 pages had me engaged and rooting for the characters. It gave me the answers I had been clamoring for the entire novel and demonstrated how far Tella was willing to go for her brother. The ending definitely left me wanting more and I am excited for the sequel. I have high hopes that the story will hit the ground running and be even better then the first! I am reading this book right now and I actually am loving it. I was off to a slow start. I will admit that, but once they characters were all together, the book took off for me. Great review. Yeah, I didn't know if it was just me but I totally didn't connect with Tella/Guy's relationship. I'm not exactly rooting for them. It felt like a cliche and I didn't see anything new added to it that made it feel fresh and original. It wasn't bad but that wasn't the big draw for me. Overall, I really did enjoy Fire & Flood though. I wasn't a fan of Scott's debut, so I wasn't sure about this one. It's been getting some pretty positive reviews though, so I guess I should since I was sent a copy! I'm glad the ending was amazing, that's one of the most important things for me. Great review! I've heard so many good things about this book, with the odd negativity thrown in. I can't wait to read it (when I finally get a copy). From what I've heard I don't think I'll like Tella much but we shall see. I love the sound of the Pandora's.